I love beer, and I also love coffee. So you’d think I’d really REALLY love a coffee beer then, right? Blurb on the bottle: Arabica is one of the most popular types of coffee. Not only does it have a delicious invigorating taste, but it also helps you avoid boring things like sleeping. We like it so much that we’ve added it an ingredient to make a dark, rich coffee oatmeal stout that’s perfect for your next beer break. We’ve called it Arabica Dabra. Sadly, rubbing it won’t result in a genie, but you will get a slightly shinier bottle. Tastes like: I’m drinking some fairly average stout out of a dirty coffee mug, except that I’m not. 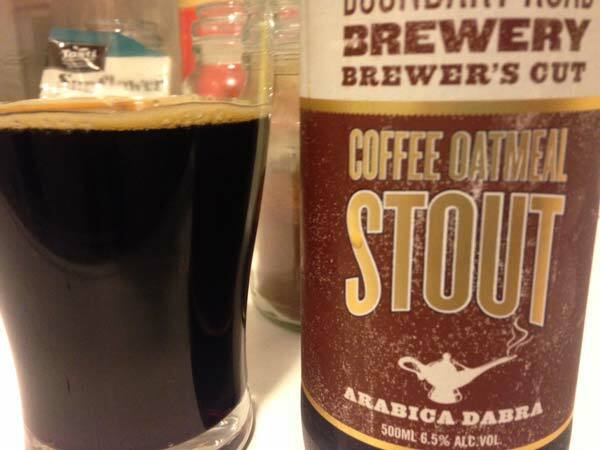 I’m drinking Arabica Dabra coffee oatmeal stout out of a clean glass, because I’m classy that way. So obviously my first impression isn’t great. This is a sweetly bitter beer that tastes of roasted coffee beans and dark chocolate, and yet isn’t nearly as nice as that sounds. Rather than blending together in an alliance of deliciousness, it’s all rather jarring, dry, astringent – like the beer hasn’t been calibrated exactly right. But at least it smells great. I really dig the coffee aroma, but even that’s disappointing because it makes me wish this beer was much better than it is. The verdict: An abject failure. But before you go accusing me of prejudice against multi-national corporations, note that I have praised Boundary Road beers in the past for being reasonable – and reasonably priced – gateway beers for craft beer newbies. I just wish this one was better.